In recent years the sight of locomotives on low loaders has become commonplace but when this photograph was taken it was somewhat of a rarity as most locomotive moves took place by rail. A considerable amount of research has been necessary to identity the locomotive as it was never based in Worcestershire. 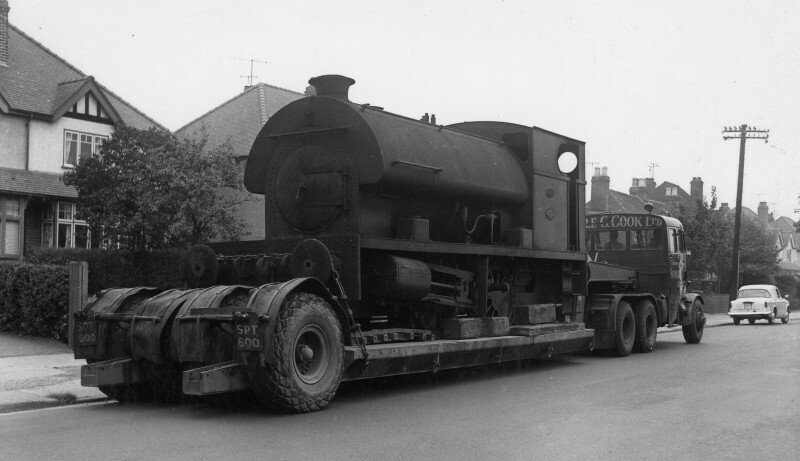 It was a very late build locomotive by Peckett of Bristol (works number 2159 of 1955; class OY2) that had been used at Barrow Ironworks in Lancashire. It was transferred in the summer of 1964 to Llanelli Steel Co Ltd in South Wales. The Dyfed & Powys Handbook published by the Industrial Railway Society states the date of transfer to be 13th August 1964 which ties-in with the date of 11th August 1964 recorded on the rear of the photograph. The locomotive was scrapped in 1969. There is insufficient detail in the photograph to ascertain the exact location where it was taken. The photograph is used by permission of Berrows Newspapers.